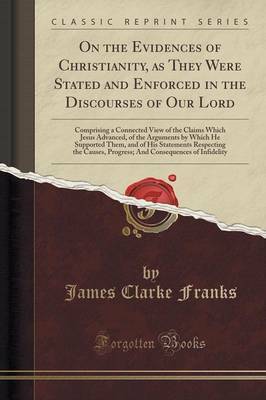 Excerpt from On the Evidences of Christianity, as They Were Stated and Enforced in the Discourses of Our Lord: Comprising a Connected View of the Claims Which Jesus Advanced, of the Arguments by Which He Supported Them, and of His Statements Respecting the Causes, Progress; And Consequences of Infidelity "Clauses from the Will of the Rev. John Hulse, late of Elworth, in the county of Chester, clerk, deceased, dated the twenty-first day of July, in the year of our Lord one thousand seven hundred and seventy-seven, expressed in the words of the Testator, as he, in order to prevent mistakes, thought proper to draw and write the same himself, and directed that such clauses should every year be printed, to the intent that the several persons, whom it might concern and be of service to, might know that there were such special donations or endowments left for the encouragement of Piety and Learning, in an age so unfortunately addicted to Infidelity and Luxury, and that others might be invited to the like charitable, and, as he humbly hoped, seasonable and useful Benefactions." About the Publisher Forgotten Books publishes hundreds of thousands of rare and classic books. Find more at www.forgottenbooks.com This book is a reproduction of an important historical work. Forgotten Books uses state-of-the-art technology to digitally reconstruct the work, preserving the original format whilst repairing imperfections present in the aged copy. In rare cases, an imperfection in the original, such as a blemish or missing page, may be replicated in our edition. We do, however, repair the vast majority of imperfections successfully; any imperfections that remain are intentionally left to preserve the state of such historical works. Remarks on the Religious Constitution of Proprietary Schools, Etc.